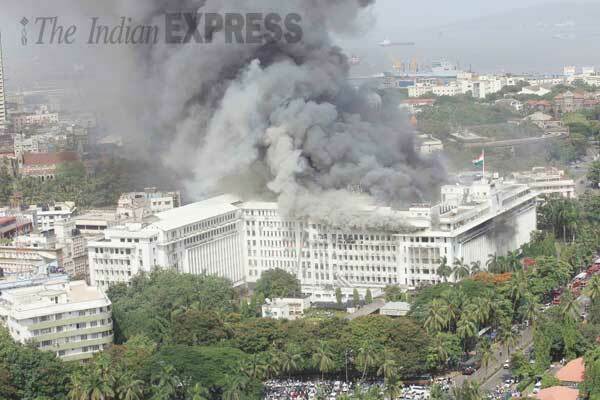 The fire gutted three floors of the building,including CM Prithviraj Chavan's office. 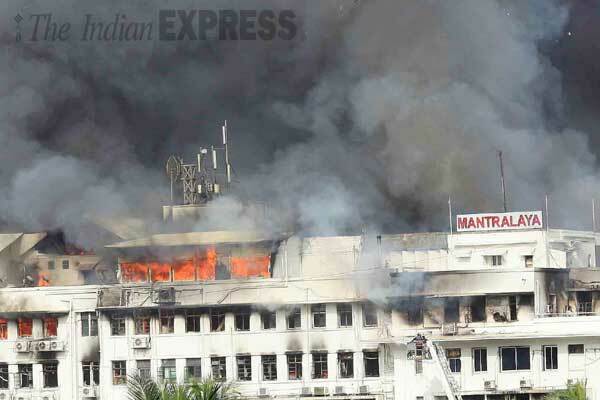 A major fire broke out today at ‘Mantralaya’,the Maharashtra government Secretariat,gutting three floors of the 7-storey building including the offices of the Chief Minister and injuring at least 11 people. The fire that erupted around 2.45 pm,continued to rage more than four hours after it was first noticed on the fourth floor near the office of Tribal Welfare Minister Babanrao Pachpute,soon spreading over to the upper floors,aided by the sea breeze. The fourth floor houses the urban development department,in the eye of the Adarsh scam,and there were apprehensions that vital documents relating to the scandal might have been lost. Extensive damage was also caused to the offices of Chief Minister Prithviraj Chavan and his deputy Ajit Pawar on the sixth floor. According to Relief and Rehabilitation Secretary Pravin Pardeshi,65 people trapped on the fifth and sixth floor have been evacuated by the fire-fighters. Pardeshi said five persons were injured in the blaze of whom two were admitted to the intensive care unit in serious condition. However,dean of state-run JJ Hospital T P Lahane said that 11 injured were admitted there of whom one was serious and others were out of danger. Two helicopters of the Indian Navy were pressed into service to evacuate those trapped inside the building but returned without any success as nobody could be found on the terrace of the building in south Mumbai. Contingents of the anti-terror force–Force One and Quick Response Teams of Mumbai police assisted the fire brigade in trying to bring the blaze under control. According to fire brigade sources,while the flames in the front part of the Secretariat have been weakened,fire was still raging on the rear side of the building. 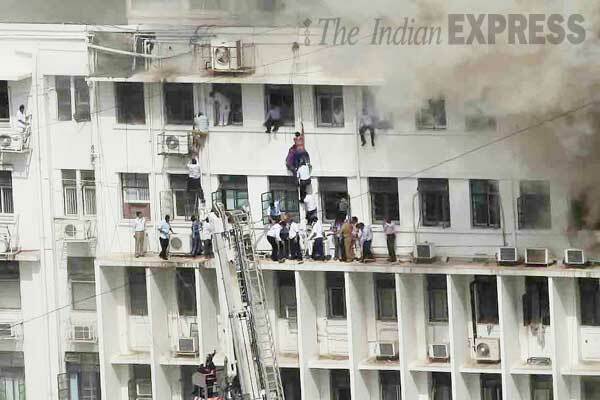 Pardeshi said nearly 3000 government employees and as many visitors were removed safely after the blaze started. Relief and rehabilitation Minister Patangrao Kadam admitted that the government had never anticipated such a major fire at the seat of Maharashtra administration and added that the damage caused to the building would be assessed soon. Chief Minister Prithviraj Chavan,Deputy CM Ajit Pawar and Home Minister R R Patil supervised the rescue efforts. 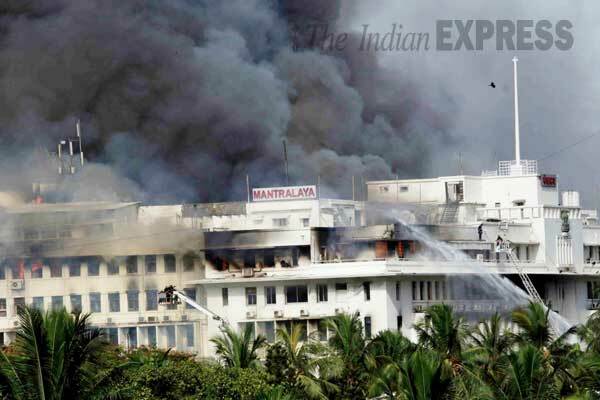 Pardeshi said the fire was first noticed in an electrical fuse and soon a general alarm was sounded across Mantralaya asking people to rush out. By 3 pm everybody,barring the 65 trapped due to “ballooning” of the smoke,had evacuated,he said. Those hospitalised included Chief Minister’s Public Relations Officer Satish Lalit,PROs in Deputy CM’s office Vishal Dhage and Sanjay Deshmukh and state Home Minister’s PRO Kishore Gangurde. All of them had inhaled the smoke,he said. Electric supply to the building was stopped. Asked if the Secretariat would remain closed tomorrow,he replied in the negative. Meanwhile,a Brihanmumbai Municipal Corporation (BMC) official said that fire brigade received the first call informing about the blaze at 2:46 PM,following which 3 fire engines,2 water tankers,and an ambulance were rushed to the spot. The injured persons have been admitted to various hospitals,including 11 at JJ and St George,3 at G T and 2 at Nair hospital. Some of them have suffered suffocation,while others have sustained minor injuries to hands and legs,J J Hospital dean Dr T P Lahane said. 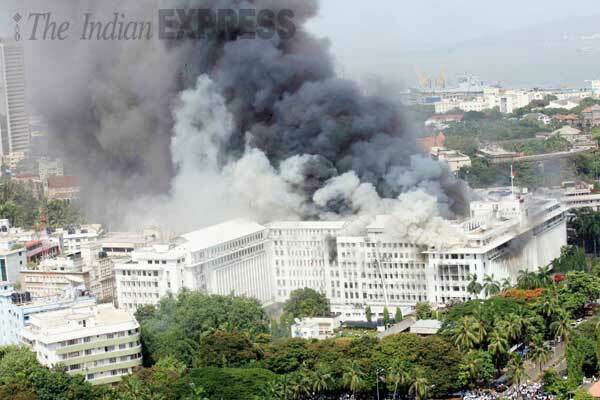 There were around 2,500 Mantralaya staffers in the building,apart from around 2,000 visitors when the fire broke out,a Mantralaya official said. The Mantralaya building typically houses around 8,000 employees on a normal working day. Chief Minister Chavan surveyed the building after the fire in the front portion had almost been put out. He later chaired a top-level meeting in the adjoining new administrative block which was attended among others by the Deputy Chief Minister. There were preliminary discussions about the extent of damage,sources said. Municipal Commissioner Sitaram Kunte,naval and fire brigade officials too were present,they said.